Welcome to Banglalink 499 TK Scratch Card Offer – Autographed Fan Jersey of Shakib. All the Banglalink prepaid and CnC connection users are eligible to enjoy Autographed Fan Jersey of Shakib with BL 499 Taka scratch card. If you are a Banglalink customer and want to know more about the BL 499 TK Scratch Card Offer, just follow the below, we reply as soon as possible. When a Banglalink customer purchase BL 499 TK Scratch Card, they will receive instantly get 1 Free Jersey. If any customers buy 499 TK Scratch Card multiple times, they will get multiple jerseys. To activate the recharge card, customers need Dial *123*Scratch Card PIN number# and press send button and he/she will get instantly 499 TK in their main account balance. Banglalink 499TK scratch card will be available in Banglalink Customer Care or retail points across the nation. This is a limited time offer, that mean any time Banglalink authority change or close this offer. Thanks for staying with us a long time and visiting Banglalink 499 TK Scratch Card Offer – Autographed Fan Jersey of Shakib content. If you have any question about the BL 499 Taka Scratch Card Offer 2017? Just comment here. We reply as soon as possible. 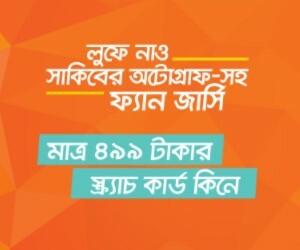 Next: NU Honours 2nd Year Exam Routine 2019 – www.nu.edu.bd.